Patagonia theme is becoming better and better thanks to your feedback. In this version I made some improvements in the code and added the dropdown menu. 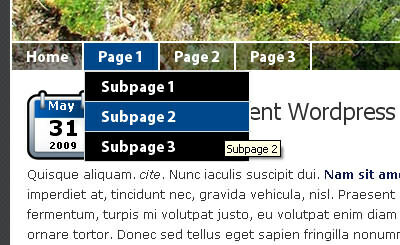 This feature is very useful when you add new pages and subpages. If you have many subpages that are nested under one parent page, you can see a dropdown menu when you pass your mouse over the header navigation bar. Also, I tested the theme on the new WordPress 2.8 and it works great. As always don’t hesitate to contact me if you have any questions. Feedback is always welcomed. Hello nice theme. How do I activate the dropdown menu that shows all the pages I created? Hey, excelent, keep up the good work! Hi , I was curious as to how I can add a new page that doesnt look exactly like the main page? I really like the template just curious as to more customizing the look and feel on added pages . Hello Mike, yes this can be done. Basically you need to create your custom page in some HTML editor and upload it to the theme folder. Then in the page section, assign the custom template for that page. I will contact you by email as it’s a little long to explain in detail here. Hey, I got a small bug and was wondering if it has been submited. When I insall 1.5 or 1.4 I can no loger use my meda lib to put media or pics on the posts? Bill, thank you so much for reporting this bug. It has been fixed and the new version 1.5.1 is available for download now. I am sending you an email. How do I change the image at the top of the page. If I were to replace it, what are dimensions? Thanks, it’s a great theme! Hello Steve! Thanks for your message. I just sent you an email with the explanation. You can also send me the image and I can do it for you, if you don’t have the tools to build your custom header. also, yesterday I posed you the header image question and see that you have helped stevekart (above) solve the same issue. would u help us pse? Hi Lucy, you are using a previous version of my theme in that site. Hi Alex, neat! Had done so; then realised that your latest version with drop down menu didn’t work (despite bveing installed) was because the older version without the drop down ability was still in our theme collection. So, the solution was to delete the older version and then reinstall the later version. Just sharing this in case others using your Patagonia theme should encounter the same problem…in future. How do I change the font size of the Main Navigation Menu in the Theme Editor as it is too large. We’ve traced the search box problem to IE8. However we have no problem with YOUR site, only OURS.